The phrase 'easy to install' on a product box generally means I'll spend only half a day instead of all day and night setting up a new device. Hewlett-Packard's ScanJet 5300C color scanner not only lives up to my definition of easy installation, it's also easy to use. The scanner's Universal Serial Bus cord made a trouble-free connection to my test PC, and by following the step-by-step software instructions I had everything up and running in 10 minutes. It's better to load the software before connecting the hardware; the software prompts when the time comes to plug in the USB. 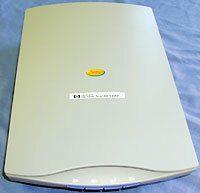 Short video clips on the installation CD-ROM also show what to plug in and where. So far, so good. But the ScanJet 5300C's 1,200-dot-per-inch optical resolution, plus software enhancement up to 9,600 dpi, seem a bit much for ordinary desktop PC imaging. Most people can't tell the difference between 600- and 1,200-dpi images, and the latter take longer to scan, occupy more disk space and ultimately slow performance. That said, the ScanJet 5300C makes images that are strikingly superior to those from $100 scanners. It picks up color in 32-bit chunks, as opposed to 30-, 24- or 16-bit chunks. That supposedly ensures better quality and shorter scanning time. The ScanJet 5300C was slower than I expected, however'it took an average of a minute and a half for a 5- by 7-inch photo at 600 dpi. The ScanJet 5300C can also e-mail, fax and copy at the touch of a convenient button. The scanner had some operational problems. At times I had to manually start it through the Microsoft Windows Start menu. The HP ScanJet 5300C has four buttons to copy, fax or e-mail images from its 8.5'by 11.7'inch scanning bed. Immediately after the software installation, I began to scan, e-mail, copy and fax a picture on the 8.5- by 11.7-inch scanning surface. Everything worked fine until I tried to process two images in succession. The scanner froze, and I had to cancel the scan. I went back to the Start menu and selected the scanner but got a message that no scanner was present. It should be possible to disconnect and reconnect the scanner via USB's plug-and-play connection without having to turn the computer off. When I disconnected the USB cable, however, the computer immediately shut down and restarted without saving anything to disk. The sudden reboot fixed the scanner recognition problem, but it made me uneasy. At $300, the ScanJet 5300C performs useful functions with decent quality. I don't question its ingenuity, only its reliability. I recommend it as a personal desktop scanner. Users who want steady, reliable performance for big jobs should look elsewhere.